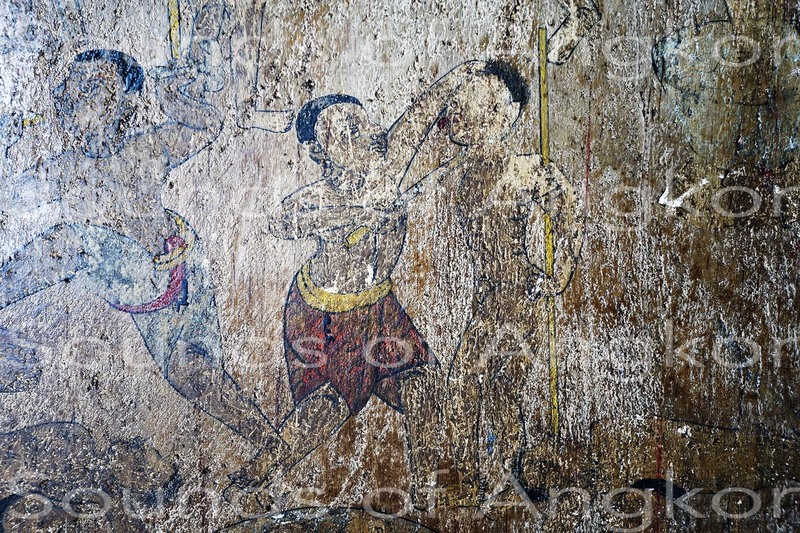 The fresco of the phleng arak of Wat Reach Bo - Site de soundsofangkor ! 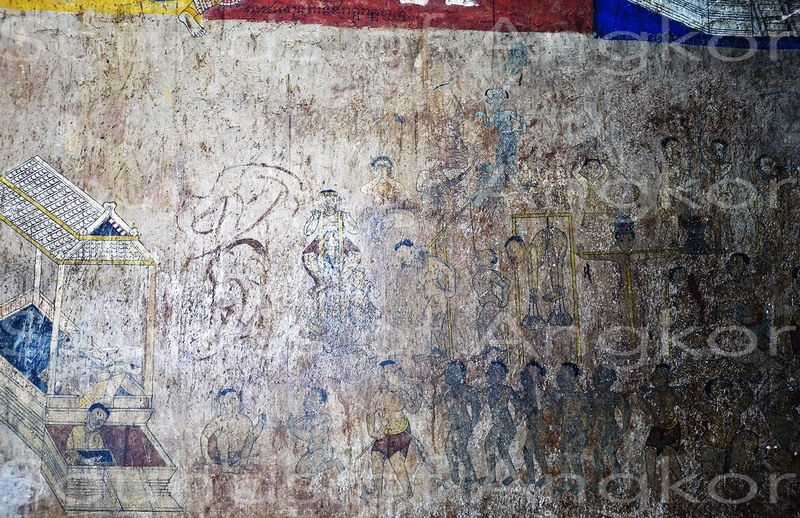 In Siem Reap, the Wat Reach Bo is one of the oldest in Cambodia after the Khmer Rouge destroyed almost all of them. It was painted on an unknown date (before 1907 or between 1921 and 1924 according to some authors, but the mystery remains intact). The fresco that interests us is located at the bottom of the building, on the left, behind the sanctuary; it represents the Buddhist hells. The scene contains an orchestra once typical of the Siem Reap region until the Khmer Rouge, once again, meticulously eliminates the musicians and ancestral culture they carried. 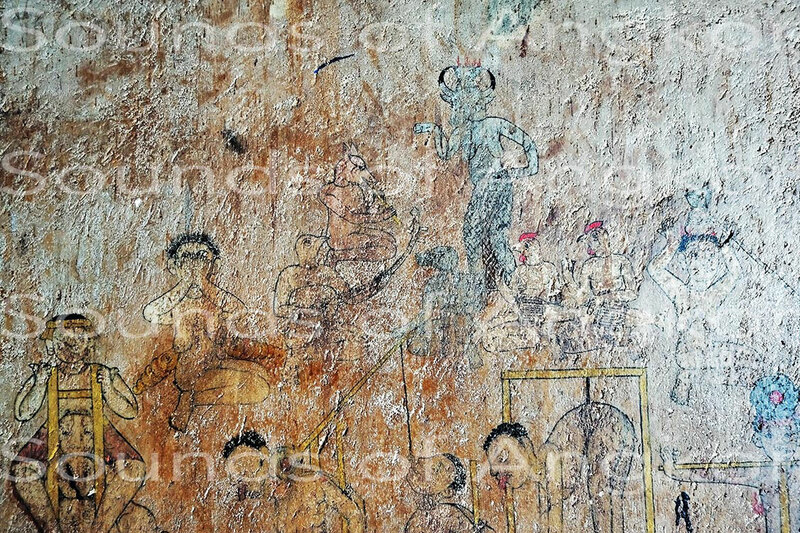 This typical Khmer orchestra accompanied, until the revolution, weddings and ceremonies of possession known as arak. There remains, in Siem Reap, a single family holding the know-how and the repertoire played with the instruments depicted here. 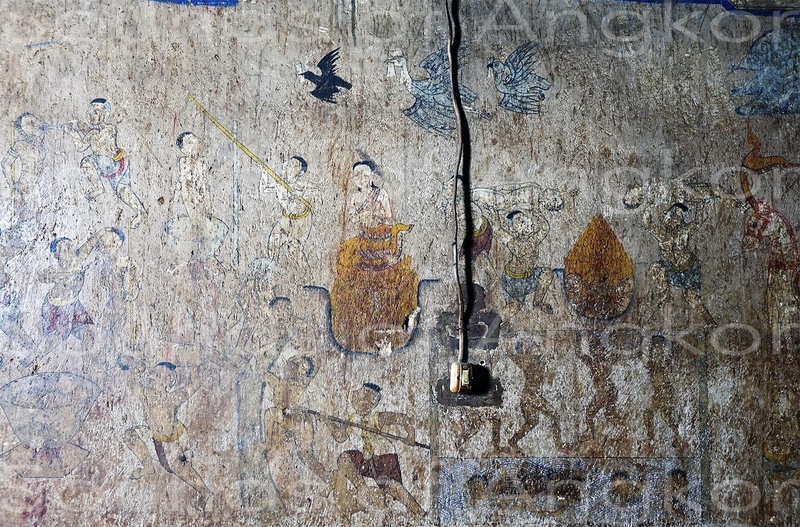 This fresco depicts the Buddhist hells. As there is a great heterogeneity of beliefs about this theme, we leave to our Internet users the task of finding any information elsewhere on the web. 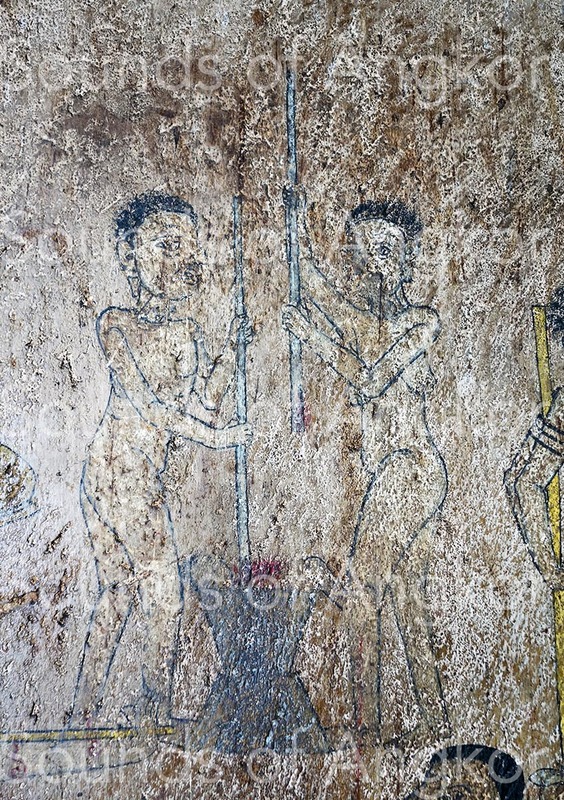 On the other hand, we have succinctly documented some of the images in the slideshow below, making comparisons of equivalence with the scene of the underworld depicted in a 1950s fresco of the Wat Kong Moch (Siem Reap). 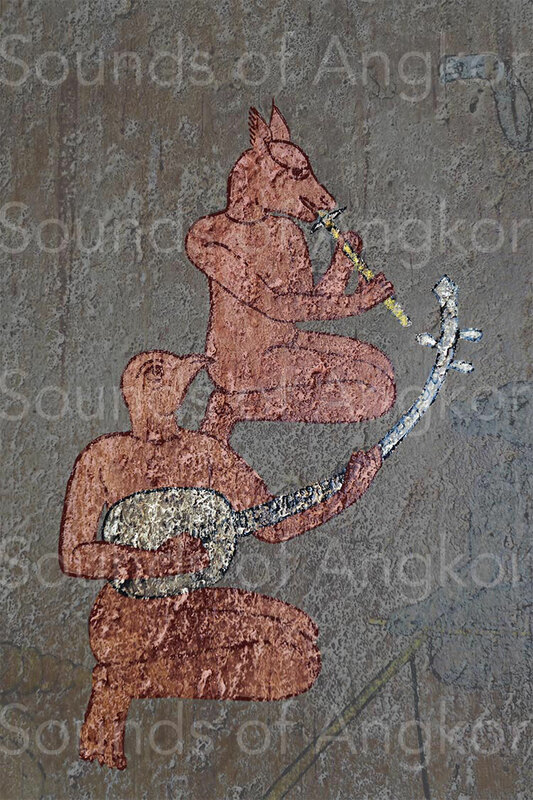 There existed, at least since the second half of the nineteenth century (we limit our information to tangible proofs) a set called phleng khmer composed of stringed instruments, as opposed to pin peat, formerly called phleng Siam, based on melodic percussion. This set was also played at weddings. Formerly it was called phleng kar (wedding band). Today it is known as phleng kar boran (old wedding band) since the instruments have changed since the revolution. 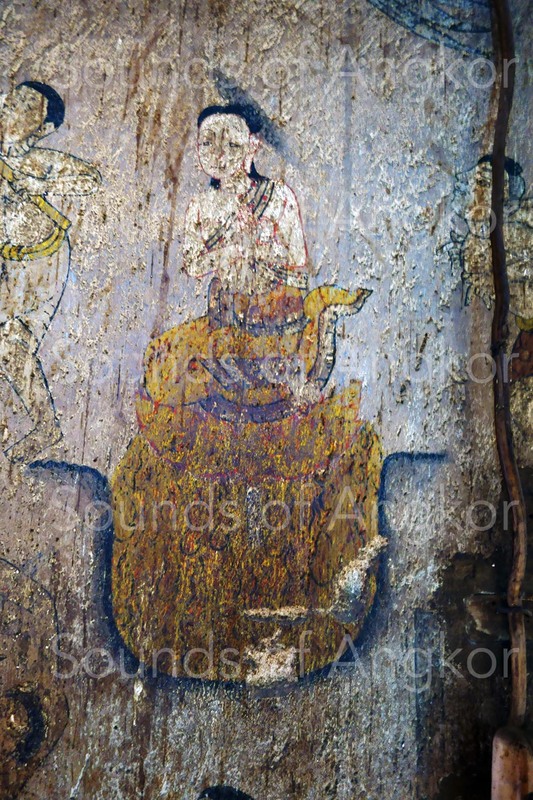 In this fresco, which indicates to us that it is a phleng arak ensemble and not a phleng kar, it is the presence of the dancer, actually a medium-exorcist (rup). 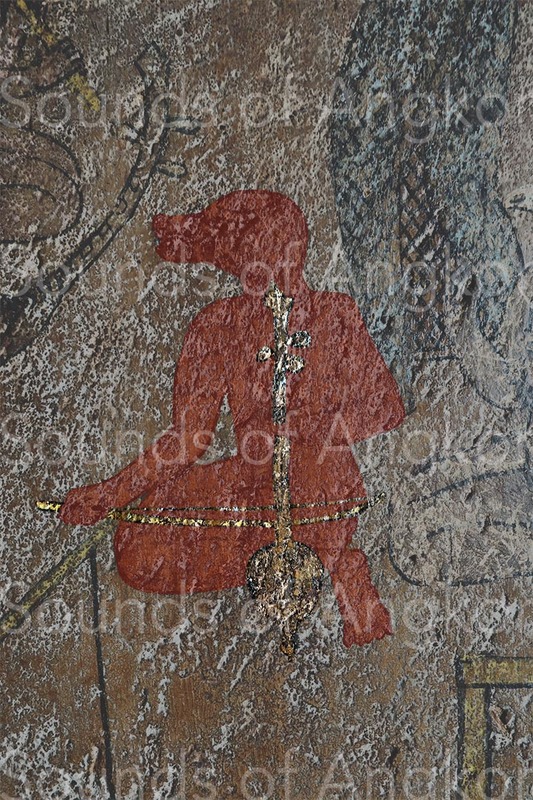 Why are the musicians and the rup represented with animal heads and next to the hell scene? 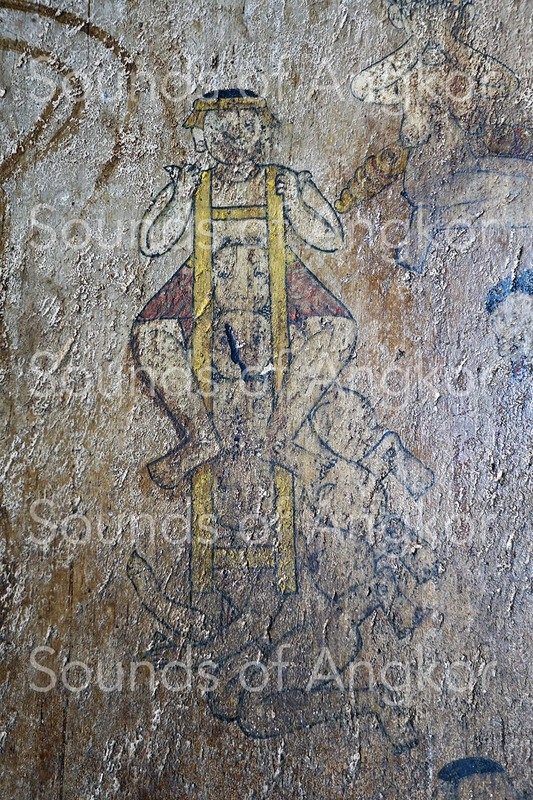 We do not have, for the moment, any explanation except that this ritual continues to survive on the sidelines of Buddhist practices and could be considered as deviant, although the Theravada Buddhist Cambodian is rather integrative. 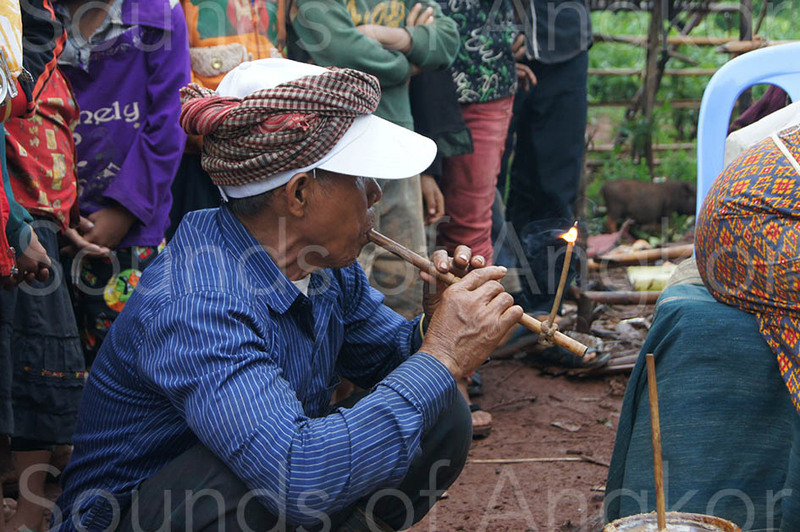 The music accompanying the Arak ceremonies is probably one of the oldest in Cambodia. The musical concept of this type of ceremonies is found throughout Southeast Asia and beyond, each with its particularities. 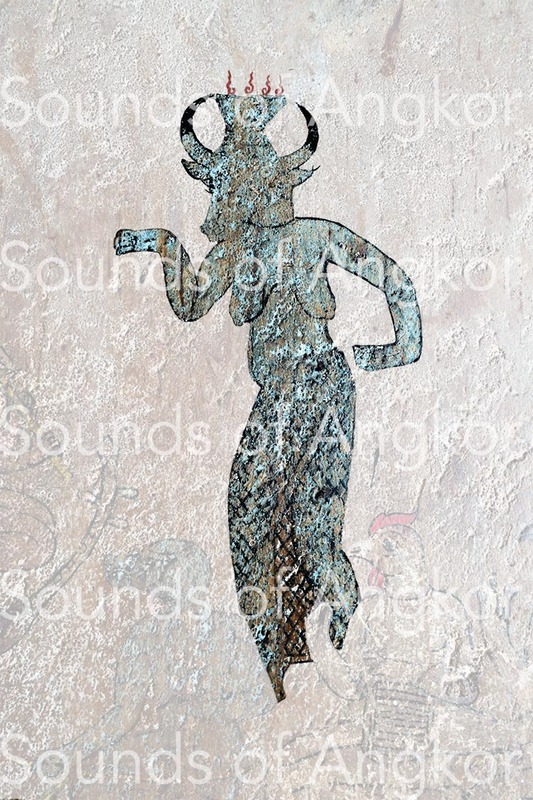 Although this musical genre has evolved over the centuries, it can be argued that it dates back to Cambodia to the times of the Proto-Khmer societies, having regard to the extent of the geographical area on which it unfolds. The oldest and most unavoidable instruments of the arak orchestra are undoubtedly the voice and the drums. The oboe is the most important instrument after these two. We do not know when it appears for the first time in this ensemble, but it seems that a reed instrument, single or double, has existed for a long time. 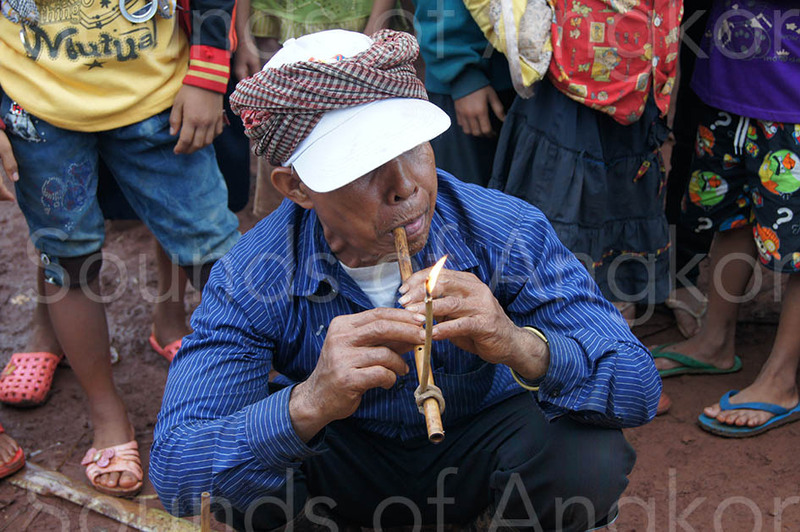 The Tampuon and Kreung of Ratanakiri use a free reed instrument (photos below) in a similar ceremony while they do not know any type of oboe. 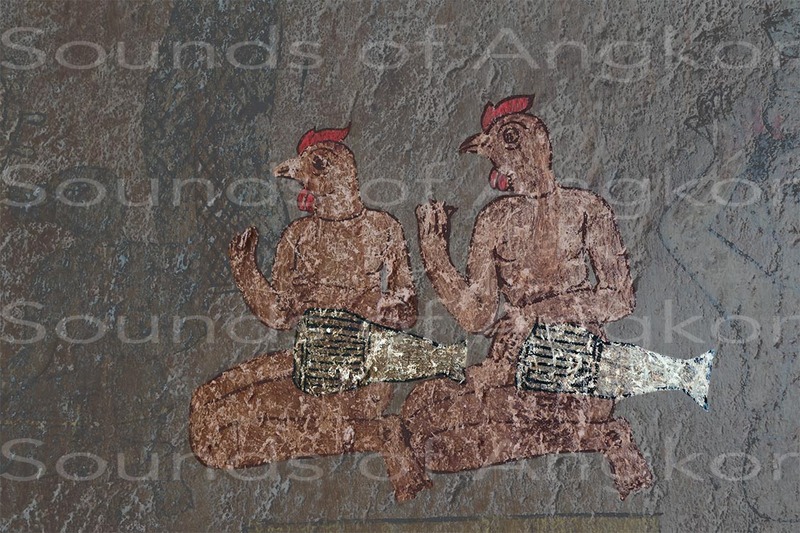 The mouth organs represented on the bronze drums of the Dong Sơn culture attest to the antiquity of the simple reed in ceremonial music. Bowed string instruments (formerly tro Khmer, nowadays tro), although they now hold an important place in the orchestra, are more recent. In order to testify to the importance of the oboe and the nature of the sound expected by the medium (rup), we wish to testify here to a singular event that occurred during the shooting of a ceremony. The medium had donned the costume of a male spirit but it did not manifest itself. The musicians, however, had started playing the appropriate repertoire piece, but the spirit did not want to manifest itself. Faced with the rebellion of the latter, the medium asked to replace the oboe pei ar by a pei oboe normally used in Khmer boxing. The musician then got on his motorcycle to get the requested instrument. He returned a few tens of minutes later. The time to soften the reed, to encase it in the body of the oboe and the music resounds through a repertoire piece of Khmer boxing. At once the medium-exorcist shuddered. 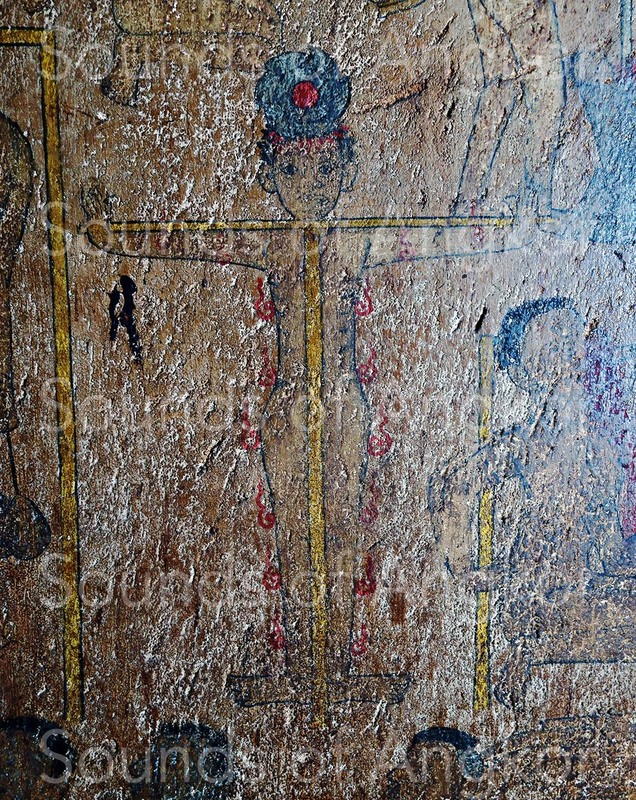 The spirit was incarnated and the martial dance began. The phleng arak boran orchestra was precisely described by the French ethnomusicologist Jacques Brunet*; we publish here part of its contents. 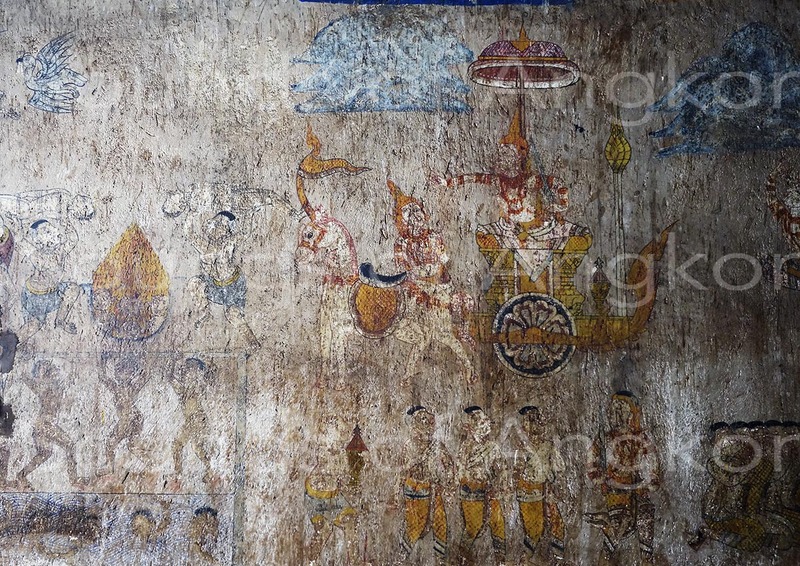 The spelling of the Khmer terms, different from the one used today, has been preserved. Then Jacques Brunet describes the phleng kar boran wedding orchestra, quite similar in structure to the phleng arak one. We publish here the generalities and the specificity of Siem Reap. “The instrumental ensemble is said, for all formations, krom phleng. 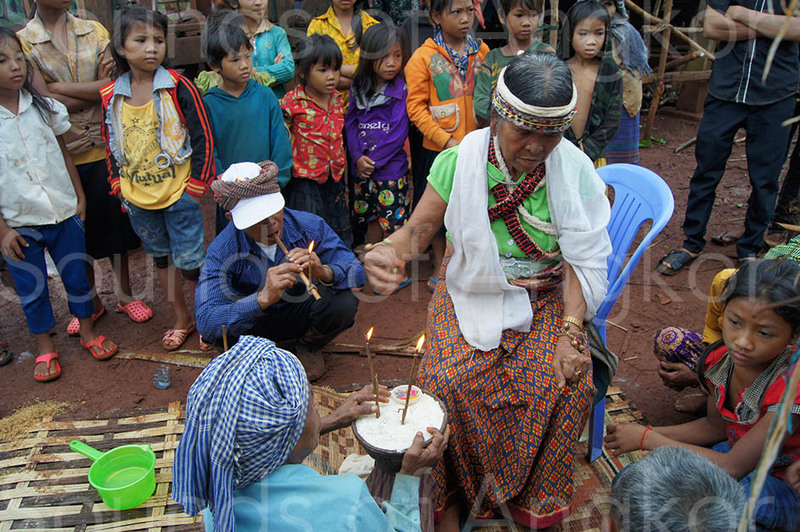 The krom phleng kar wedding orchestra does not always have the same composition and varies slightly by province. There is however a typical formation of this orchestra and when it is not respected, it is due either to a lack of musician for a given instrument, or to a decision of the leader of the musicians who decides to compose his orchestra otherwise. Many variants, however, are not considered to be opposed to the traditional formula, but just as another possibility within the tradition. 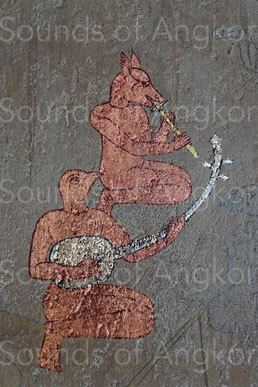 The phleng kar set consists of a monastery, a tro Khmer fiddle, a pey oboe, a chapey lute and one or two skor arak drums. It has become unusual to encounter this comprehensive training as described above. 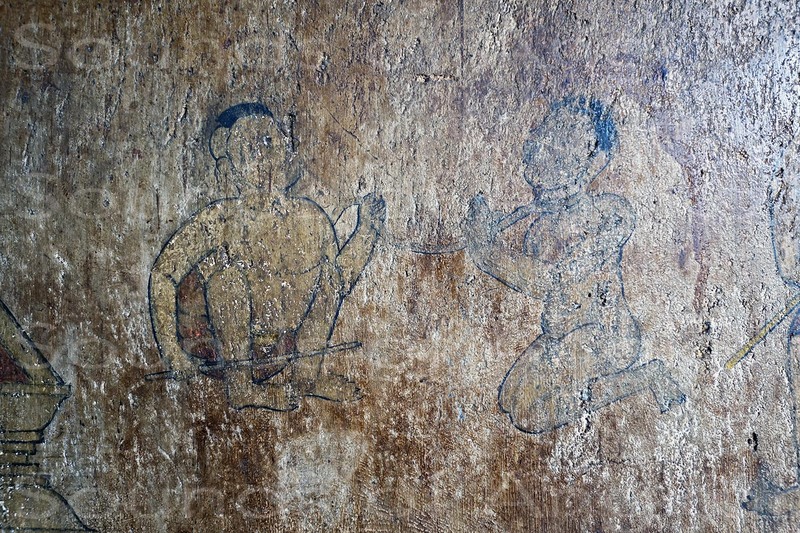 In the province of Siem Reap, there is never any sadêv (ksae diev) in the orchestra. Yet some singers - very rare, it is true - play the sadêv as a soloist, as an accompaniment instrument. 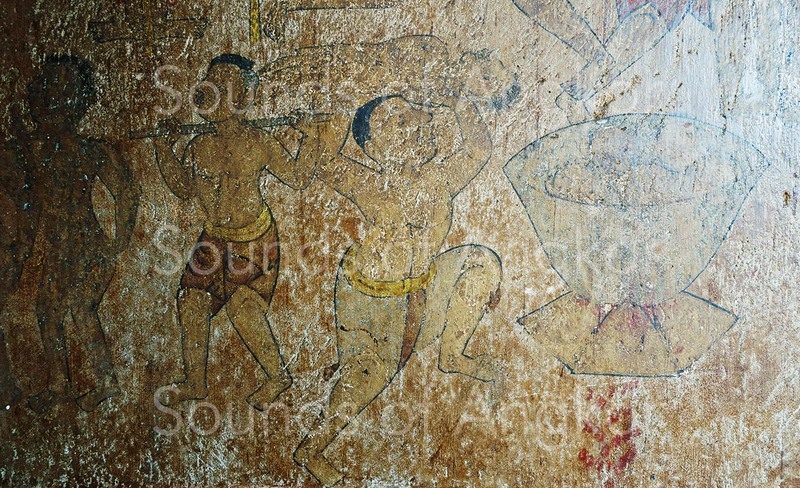 The phleng kar orchestras of Siem Reap and Sras Srang that we studied did not integrate the sadêv and their training is, however, considered quite traditional. " 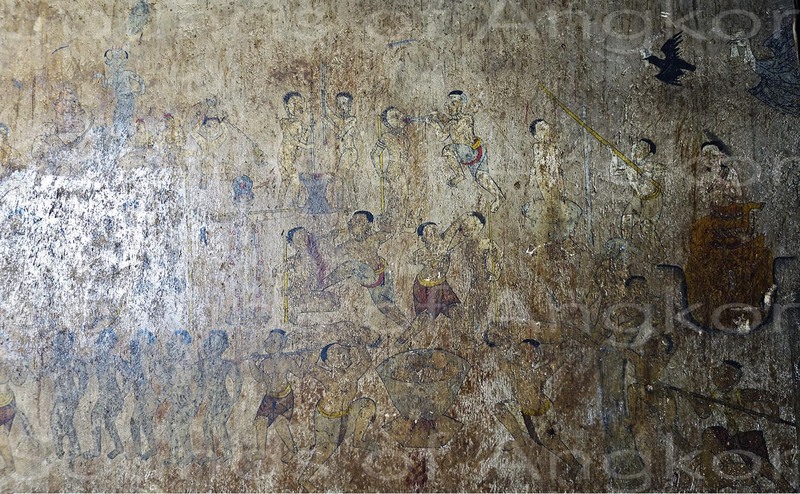 This description corroborates the iconography of the ensemble depicted on the fresco of the underworld of Wat Reach Bo.